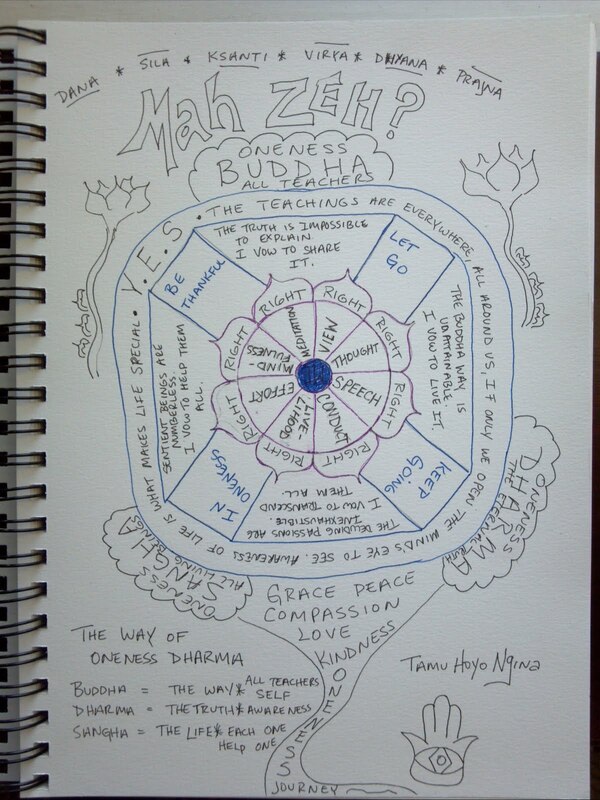 In last night's Lay Ministers class are assignment was to create a mandala that included our favorite sayings and capping/code phrases from previous classes. I decided to use anything that came to me. So I started with the space in the center which represented my pure soul of being. Tenzin Wangyal Rinpoche refers to it as the wisdom body of all the buddhas. From there I led outward in the lotus with the Eightfold path. Straight from there are four sayings of Rev. Koyo sensei and my dear mother that have helped me on my journey. Be thankful. Let go. Keep going. In oneness. Intermingled throughout those four I placed the Bodhisattvas vowa. I dreamt a writing out the full dharma vows from my TiSarana ceremony but the paper was too small or I was too lazy so it was Boddhisattvas vows instead as for me the represent the entire vow. Outward from there I remind myself to say Y.E.S to (your) everyday spirituality. And spirituality is everyday because as Rev. Gyomay Kubose sensei said "The teachings are everywhere, all around us if only we open the mind's eye to see...."
I really enjoyed the assignment and look forward to creating more word mandalas. 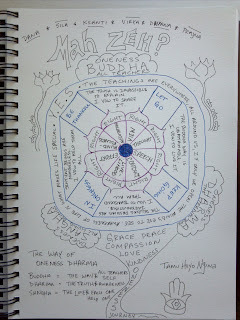 Other's in class also presented some really nice mandalas as well.